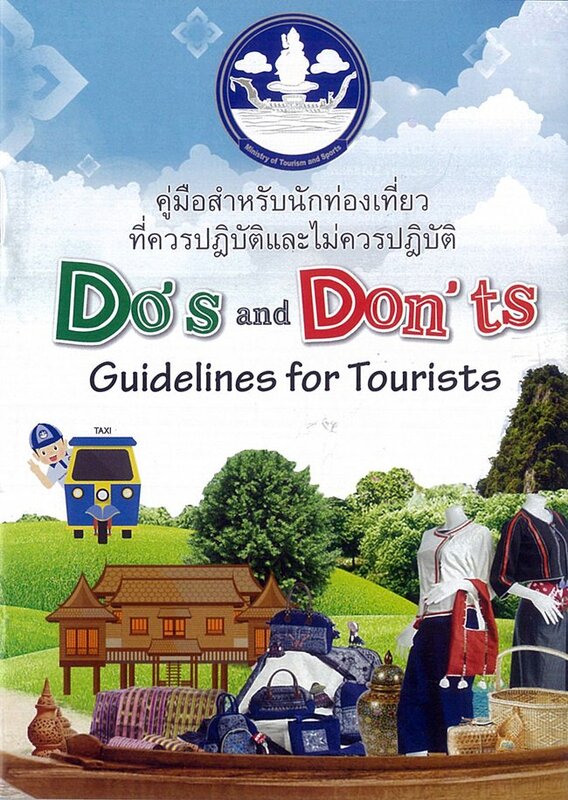 Staffers from the Chonburi Tourist Assistance Center hand out “Do’s and Don’ts Guidelines for Tourists” booklets in Pattaya. The Tourism Safety and Security Standards Division gave Pattaya visitors booklets and advice on “Do’s and Don’ts” for tourists as part of its expanded campaign to build trust and enhance security in the tourism sector. 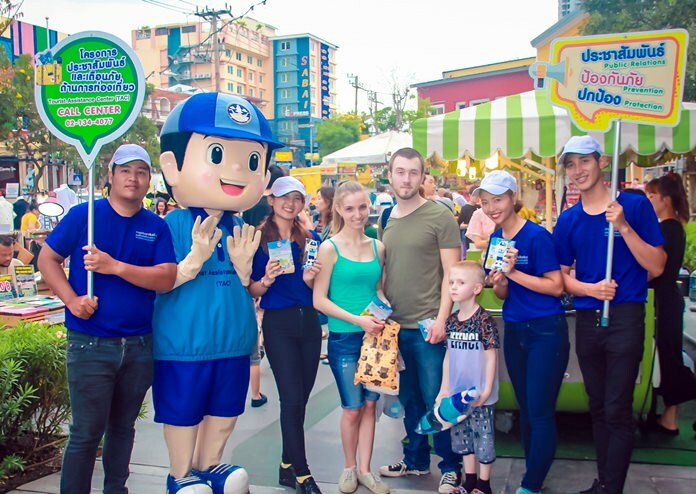 Mr. Jaturon Phakdeewanit, Director Bureau Tourism Safety and Security Standards was on hand at the Central Marina shopping mall in North Pattaya April 7 as staffers from the Chonburi Tourist Assistance Center accompanied by the ministry’s Namjai mascot handed out booklets in Thai, English and Chinese offering guidelines on what tourists are allowed to do and what would violate the law or Thai cultural mores. They also provide basic advice on traveling around the nation, guiding visitors in the right direction. The booklets are part of a “three Ps” push by the ministry’s Tourism Assistance Center to improve service. The three Ps stand for “public announcements”, “prevention” and “protection”. Public announcements will provide information on where tourists can contact or seek assistance of any kind. Prevention covers advising visitors of any potential harm or danger. And protection centers on providing information on tourists’ rights and providing assistance. The ministry previously brought its three-Ps initiative to 10 popular tourist destinations and says it has proved a great success and generated positive responses from visitors. They have now expanded their project to a total of 15 popular destinations nationwide. 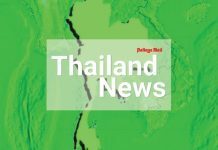 Jaturon said workers at the 46 provincial assistance centers around the nation will be distributing the booklets and hope to place a assistance center in every one of Thailand’s 77 provinces and grow its workforce from the current 221 to 250 people. Other Tourist Assistance Centers include assistance with fraud, extortion and other crimes. Staffers will advise on legal proceedings and provide comfort tourists may need. This also includes help with court cases and more. To file a report or seek assistance, contact the TAC Call Center at 02-134-4077 24 hours a day. 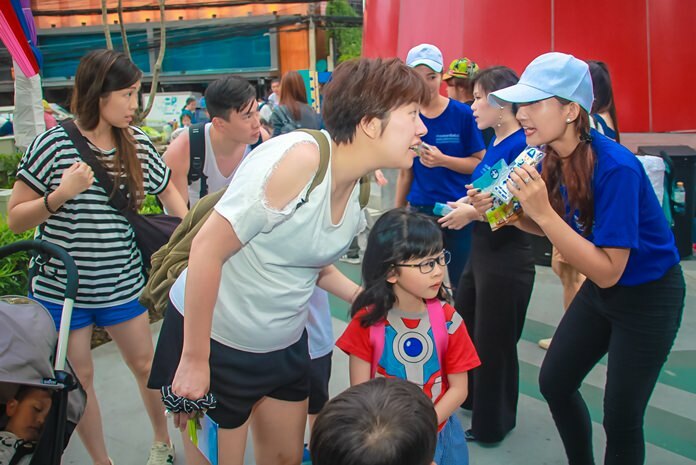 Namjai, the mascot for the Ministry of Tourism and Sports hands out booklets in Thai, English and Chinese offering guidelines on what tourists are allowed to do and what would violate the law or Thai cultural morals.